Generally speaking, underwear is not hilarious. Animals – the non-talking, real-life kinds – don’t usually send children into fits of giggly hysterics. However, put the two together, and even I have a hard time keeping a straight face. To prove this point I just asked my 4-year-old son what he thought about dog underwear and he laughed so hard he could hardly breathe. 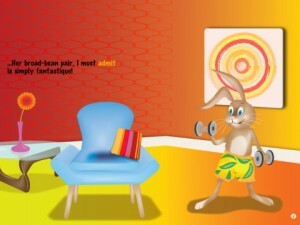 Pets In Pants HD is a wacky interactive e-storybook that appeals to the funny bone in all of us. 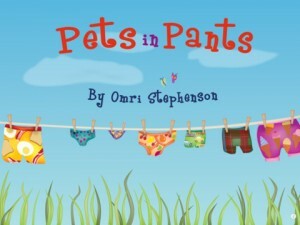 Written by Omri Stephenson and released by PicPocket Books, the story features pets of all shapes and sizes lounging about skivvies. The cat favors a fish-bone print, the goldfish fancy florals, and the rabbit prefers fruits and veggies. Of course the pets don’t wear their pants when the humans could catch them! The narration is engaging and clear, and each word is highlighted when read aloud. Interactive hotspots on each page play animal sounds or silly sound effects. The only obstacle we ran into was the occasional use of British colloquialisms – “strawberry fool”, “settee”, and “bloomers” are just a few examples. After some easy explanation (and Googling of British desserts) the kiddos were far less confused. This app is a great addition to your e-library and helps with early reading and imagination development. While there are flashier, louder e-books for kids at this download price point of $2.99, this particular app is cute, well-made, and fun to read again and again. And again. 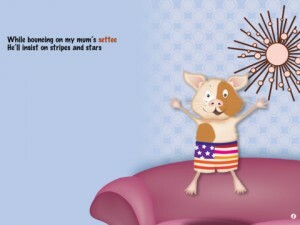 All ages will get a kick out of this funny, narrated story!